Stumbling into bands that have to offer an authentic take on music doesn't happen everyday. 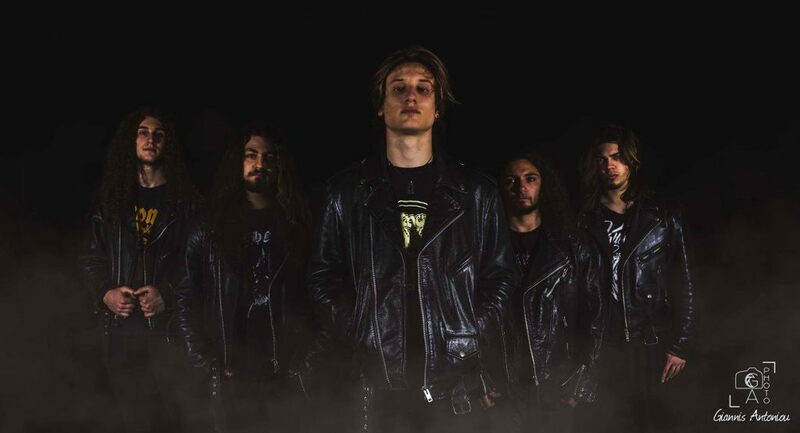 SERPENT LORD prefer to refer to their music as "heavy metal", but there are things happening under the hood that surpass the boundaries of the term. The band was kind (or sinister?) enough to shed some light upon the dark essence of their recently released debut "Towards The Damned". Are you ready to be damned? Greetings guys and congrats on your new album! Hi Giannis, thank you so much for your good words in your review and for this interview! It’s a great pleasure to us! Could you briefly provide the story of how SERPENT LORD came to be? Is there a special meaning behind your name? SERPENT LORD were formed in 2016 by George Savvage, our first singer/rhythm guitarist and Konstantinos Sotrirelis (bass). 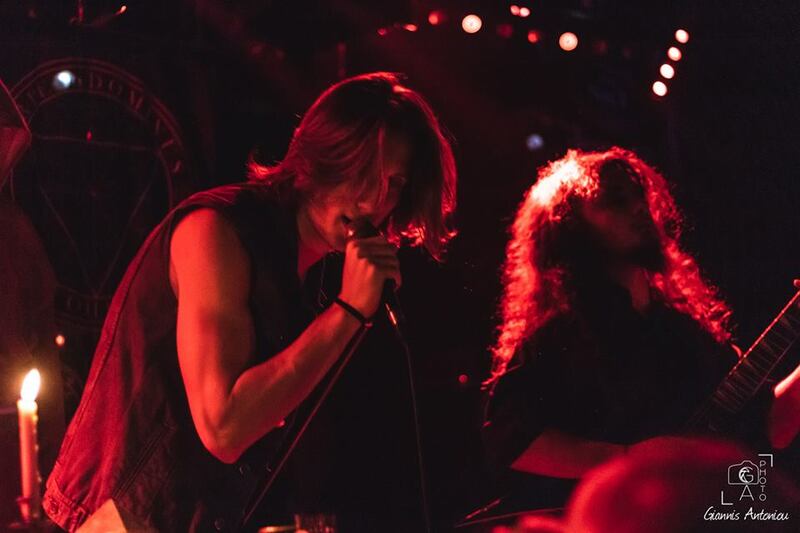 George Terzitanos was added in the line-up and together we started our first steps with some shows as support act to INNERWISH, OMEN and GRAND MAGUS. We recorded demo with two tracks along with a session drummer. 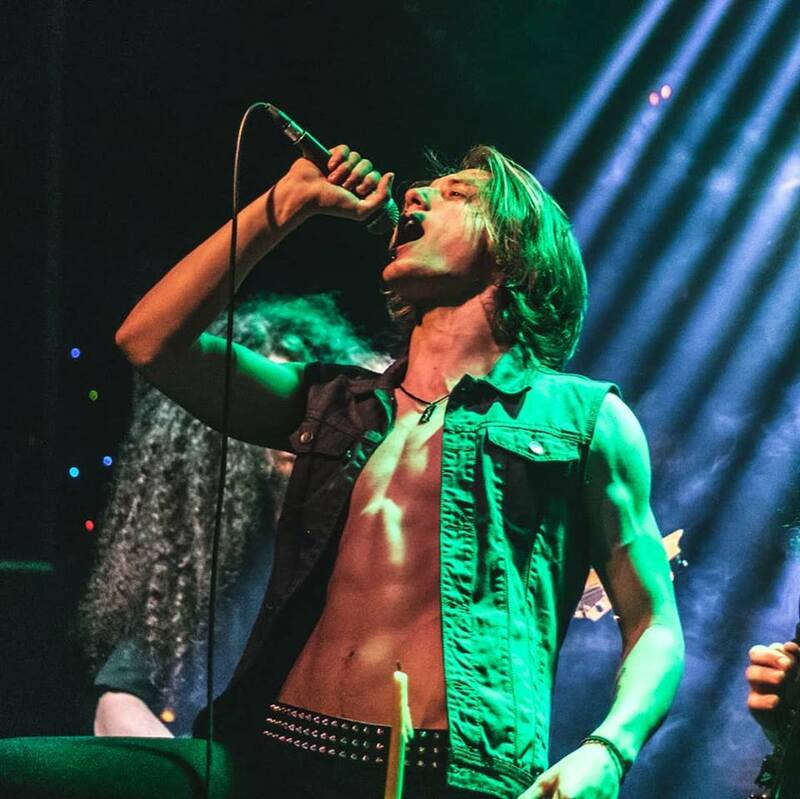 After a line-up change on October 2017, Marios Arikas took over the lead vocals and Achilleas Chrysohoidis the rhythm guitar on the live shows only. On summer 2017 we were in the studio so as to record our debut album, “Towards the Damned”, which was released on September 14th 2018 via Alcyone Records. Vaggelis Karafotis is our drummer since this recording. The name comes from the ancient Serpent, the snake that persuaded Eve and Adam to eat the fruit from the forbidden tree. Also, people personify the evil with the serpent, so we thought it sounds cool and evil. You got to share the stage with OMEN and GRAND MAGUS. How did this affect you as a newcomer band at that time? Our first ever show was with INNERWISH. We have to thank Vaggelis Kamaretsos from Eightball and the band that decided to give an opportunity to a band that they hadn’t heard at that time. It seems that we made a good impression to some people so Christos Papanantsidis put us on the show with OMEN. This is how our journey started. We released our demo, we had three live shows, so 3P Lab suggested us as a supporting band for GRAND MAGUS. It was a great opportunity and we agreed. We have learned a lot about ourselves in these shows. We learned how to organize our time, how to rehearse, how to communicate with each other. We understood the importance of a show. It is very important not just to play your music, but to give a show that will mesmerize the audience. That’s why we have candles on the stage, banners, skulls, the Testament, even monks. Also, we met a lot of people who liked our music, people that they didn’t like it, promoters. It was the best way to start and we are very thankful to the people mentioned above. 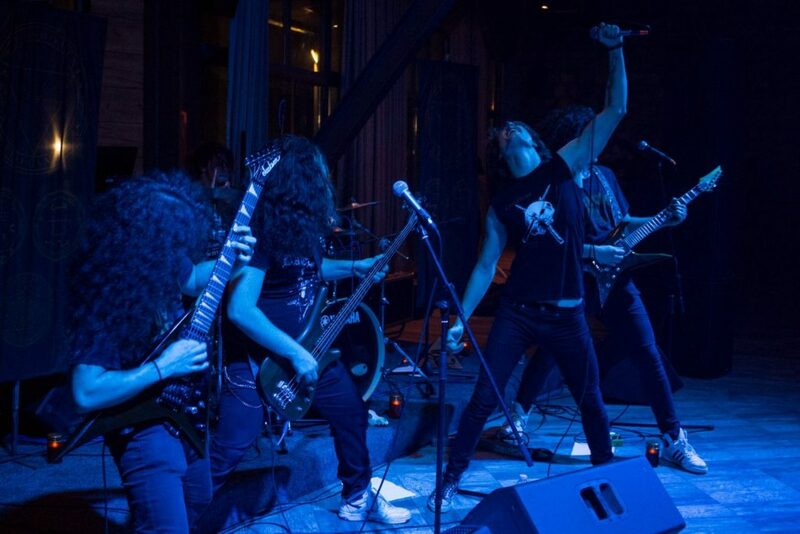 Most of you are (or have been) active in a few bands in addition to SERPENT LORD. What do you hope to achieve with SL that’s not achievable with the other bands you’re involved? For Konstantinos Sotirelis, George Terzitanos and Marios Arikas, this band is the priority. It’s our main band and nothing can change that. Especially the first two has written all the music and lyrics on the first album and Marios has now written a new track. Our drummer, Vaggelis Karafotis, is into many bands, mostly as a session drummer and Achilleas, our rhythm guitarist, has helped us for the last months and now he is on his army duties. But the band’s body is the first three names. Yes, we had participated into other bands before, but nothing can change that SERPENT LORD is our main priority. It’s our own creation and we are very happy that Marios feels the same way as we do. We fight everyday and we sacrifice a lot of things to achieve our goal, which is a European tour at some point. We want our music to travel as far as possible. We know that we won’t make a living from our music, but that’s not the case. We want to play as far from our country we can. So, we rehearse a lot and we try everyday to promote our band. When I first saw your photos I was expecting a proto-heavy/occult rock band to be honest. However, after I listening to your music I realized that was far from the truth. How would you describe your music? We describe our music simply as Heavy Metal. We know that this is not enough sometimes; people need to put tags on everything so we say that we play occult heavy metal. Our music is darker than a heavy metal band, our lyrics and concept are about occultism, mysticism, rituals, evil, demons, magic, religion and all these stuff. We didn’t want to sound like the other occult rock bands. We have a lot of extreme influences. Our main influences are IN SOLITUDE, ICED EARTH, DEATH, MERCYFUL FATE, CANDLEMASS, JUDAS PRIEST, MEGADETH, ANNIHILATOR, ROTTING CHRIST and so many bands. We wanted to make a combination of our influences, putting our own touch. That’s why we have many progressive elements. We wanted to sound evil, dark, extreme, but at the same level melodic and atmospheric. We believe we managed to achieve that but the fans will judge that. At this point, we are very satisfied of our work and we will do our best to improve ourselves on the next release. Nothing is perfect, so we have to work hard once again. Does your interest in the occult start and stop with your music or is it something more than an “art” to you? It definitely is more than art, we are deeply attracted to stuff like philosophy, theosophy, religious views of this life and what comes after, divination and more. The experience of the divine is what many seek but a few achieve. In SERPENT LORD we like to research about it from many points of view and wait for the outcome and whatever might be our fate. Moving on to your full-length debut, “Towards the Damned”, would you like to share a few info about it? We recorded this album from August 2017 to January 2018. It took us a few months because we had some problems, such as the departure of our singer and the tendinitis of our bassist. 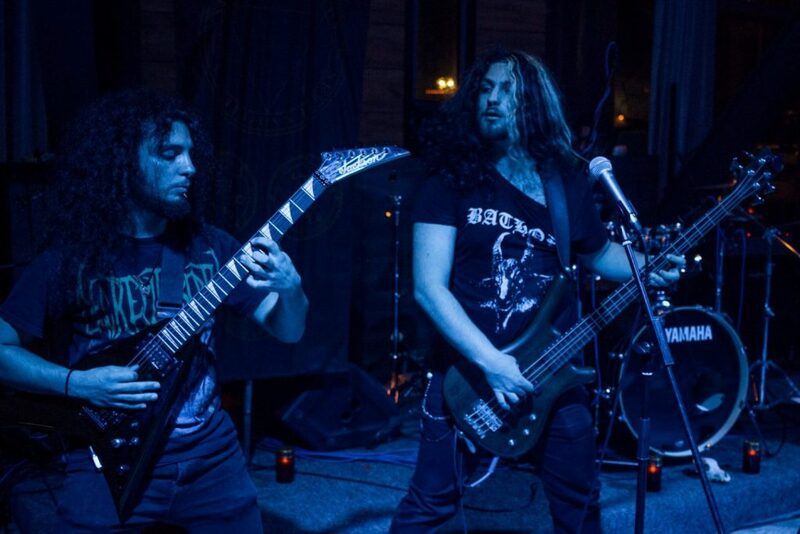 Our producer was George Stournaras, from Infected Studios, who is actually the singer and guitarist of MASS INFECTION. He did a great job and our cooperation was extremely good, he knew exactly what we wanted to do and he helped us a lot, so we thank him so much for his contribution. The composing of the album took only six to eight months. We were three members with too many ideas, riffs and songs, so it was quite easy for us to compose ten songs. It was one of our greatest experiences and we acquired such a strong bond because we were together so many hours each day, trying to decide which riffs to use on every song. Every song has a story to tell with its music and its lyrics, every song is a situation that we have been through, even if you can’t realize it at first. How do you work when it comes to songwriting? George Terzitanos and Konstantinos Sotirelis write most of the music and the lyrics. On the first record, “Towards the Damned”, every song is composed by them, expect the “Sacrilegium” and the “Blood Offering”, which are written from George Savvage, George Terzitanos and Konstantinos Sotirelis. We write some riffs, some ideas or some songs and we present them to each other. If we like it, we continue to work on it. There are times that the one is jamming on a riff and the other one writes the next riff, the chorus or something like that or there are times that we start and finish a song together. We have so many ideas and we write every day new riffs and now, Marios is getting into our logic and point of view, so he writes his own riffs and present them to us. We have some songs ready, but we won’t record a new album now. We want to promote “Towards the Damned” as much is possible. Most occult bands prefer a more “direct” approach on the subject, while you seem to “explore” things through the sinister stories of Christianity. Why is that? Actually, we want to explore things in general. We want to explore music so the lyrics have to be on the same level. Not only stories of Christianity. We have read a lot about magic, alchemy, Egyptian Gods, Greek mythology, occultism and mysticism, rituals, but we like to pump out subjects from the Old and The New Testament. We believe that it is more interesting to talk about things that not many people have talked about. We don’t find interesting to talk about themes that everyone has wrote something. It’s better to put the listener into a process of searching the story behind the lyrics. Also, our lyrics have a strong connection with our feelings and the situations we’ve been through that period. We are thinking a lot about death, love, about religion, about God, about everything related to metaphysical, so we use an interesting story as a cell, so as to talk about our feelings. You won’t understand it at first, but I’m sure that if you listen to the music and read the lyrics carefully, you’ll find your own connections with these subjects. I wasn’t able to find any info about your “Evvuio Oitovo Iman” song other than it’s written in ancient Phrygian. Would you like to share a few info about it? This song has a more experimental view compared to all our other songs, we just wanted to go one step further. We wanted the music to go on an atmospheric level and the lyrics had to be something mysterious. The lyrics are from signs found by archaeologists where it is supposed to be Phrygia in ancient times. It is our point of view of the subject as artists. The signs are from a specific scavenging site and are sung in a way that makes sense as if it is a story. Why did you write the lyrics using a dead language? Should the reader assume that you’re also fans of bands like DEAD CAN DANCE? As we said above we like to seek the enigma, so dead languages are something that is exciting, because you can understand what was the view of the world to people from unknown times. As for the second part, we could say that only George is a fan of DEAD CAN DANCE, but the idea and the writing process of “Evvuio Oitovo Iman” was not influenced by them. You released “Towards the Damned” through Alcyone Records. If not mistaken, it’s a new label and you’re their first artist ever. How did you come into agreement? Exactly, it’s a new label and we are their first release. As you may probably know, most of the labels don’t get into a process of listening a newcomer’s release. However, we had some good proposals, but Alcyone Records did the best so we agreed. Also, Konstantinos works on this label, so we wanted to “control” our promotion. We are going to shoot a new video clip for the song “Seed of Divine” with Bob Katsionis once again, but we haven’t decided the release date yet. We want to play live shows, we are trying to book some shows in Greece and abroad, but nothing specific at the time being. We are open to suggestions, though. Also, we have some plans about hitting the studio the next year for something that will probably surprise you, but we can’t give you more details on that. Thank you very much for this interview. It was the best so far and we really appreciate the fact that you gave us the chance to talk about our band and our album. Support the bands you like so as to be alive! Listen to our music, come to our shows and travel into a mental reality where the gloom, the evil and occult rites are actually happening. Prepare your souls, unholy spirits and Get ready to be baptized to the eerie sound of the Serpent.